At the end of this academic year, work is scheduled to begin on a major rehabilitation project that will give new life to the Charles River undergraduate housing complex at Brandeis University, a full generation after the four, six-story concrete buildings first opened. School officials say the work, approved by the Board of Trustees at a Feb. 10 meeting, is critical to the future of undergraduate living at Brandeis and the university’s planned, measured increase to the size of the student body. The much-needed renovations will be made to all of the 140 apartments within the complex. "We're grateful for the board’s support and very excited about this project," said Jean Eddy, senior vice president for Students and Enrollment. "Charles River will be a great option for our upper class students and I think they're really going to enjoy the improvements. We hear from students all the time that this is the type of housing they want, so this project is vital to the quality of the student life experience." The board’s approval for the project came amid a years-long, intensive focus on living space for undergraduates at Brandeis that has included construction of the Village complex and reconstruction of the Ridgewood residence halls. It also marks a continuation of school officials’ desire to keep the environment at the forefront in the capital planning process wherever possible, and as work progresses. Mark Collins, vice president for campus operations, Daniel Feldman, vice president for capital projects, and Jeffrey Apfel, executive vice president and chief operating officer, each agreed that time and the unavoidable toll it takes on living spaces in particular left Brandeis with no alternative to undertaking the Charles River renovations – and sooner rather than later. The work is expected to cost about $9 million, which should be repaid over time as the apartments are fully occupied and produce revenue. Built in 1972 less than a mile from the center of campus, the Charles River apartment complex comprises approximately 137,300 gross square feet and houses up to 351 students. Feldman said work should begin when this academic year ends, with a goal of having the units ready for students’ arrival in the fall. Sophomores, juniors and seniors will occupy the units. Topping the list of improvements are full installation of sprinkler systems and refurbishing of kitchen and bathroom spaces in the apartment-style units. 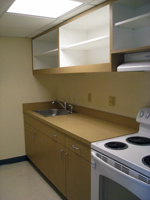 New cabinets, new appliances and new lighting will be added. Work will include patching and repair of walls and refinishing doors, replacement of carpets, tile, and furniture, and replacement of electric heating units. With using less energy in mind, the units will be equipped with high efficiency lighting, said Feldman. 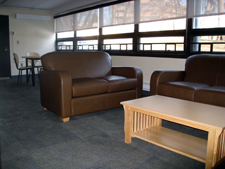 Carpet tiles will be used because they are more easily and more cost-efficiently replaced.